The Nama karoo region represents the largest part of South Africa. It is situated in the higher inland western part of South Africa and Namibia. Rainfall is mainly during the summer months with peaks in autumn and spring with frost in winter where the altitude is higher than 600 m above see level. It is not as rich in succulent and bulbous plant species as the succulent karoo parts of Namaqualand, Knersvlakte and Klein karoo (Little karoo) region. The vegetation here is known as Nama Karoo and consists mainly of dwarf shrublands, sparse grassland and small trees and shrubs on the outcrops. The geology varies with mainly shale and mudstone being prominent as well as the characteristic dolerite dykes. Soil is fertile and with good rainfall grass species becomes more prominent. Various plants from this region have been introduced to the conservatory. This section has been filled with mainly dolerite and shale rocks from the Fraserburg region and surface limestone from elsewhere. Prominent plants introduced include many members of the Mesembryanthemaceae. These include Lithops, Pleiospilos and Titanopsis, known as stone plants because they resemble pebbles and are difficult to see on the ground. The liver plant (Pleiospilos barbarae) also looks like a rock, but grows exposed. Their leaves are sometimes ground up and mixed with snuff. The spiny vygie or doringvygie(Ruschia intricata) is a small shrublet bearing spiny branches and pink flowers during the winter and spring. 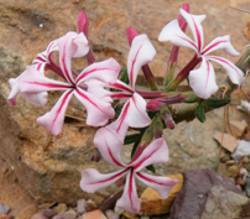 The ystervark-kambro (Pachypodium succulentum) is a common species in the south-eastern karoo. This plant has a succulent trunk which usually grows underground. Its attractive colorful star-shaped flowers appear during summer. The kraal aloe (Aloe claviflora) has gray tapering leaves. It is called the kraal aloe because it forms circular kraals as it grows: it starts off from a single plant, which continuously divides, and eventually forms a circle. Its striking inflorescences, bearing reddish flowers, are produced horizontally. The partridge-breast aloe (Aloe variegata) grows in small clusters. It has attractive variegated leaves in 3 ranks. It usually grows below shrubs only exposing its conspicuous red flowers during springtime. 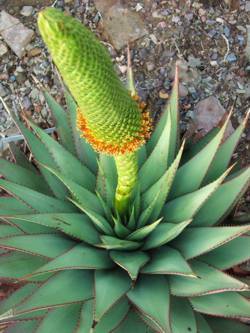 The Herero aloe (Aloe hereroensis) reaches its southern limit in the karoo. It flowers during winter time. Broom’s aloe, also known as the snake aloe (Aloe broomii) is a large robust solitary species. It has a dense rosette of short, dark green, rough spiny leaves producing an inflorescence as thick as a man’s arm, with small yellowish flowers, during spring. It is named for the anthropologist Dr Robert Broom. Aloe pratensis reaches its southern limit in this part. It has an extended inflorescence with orange-red flowers during spring. White-speckeled aloe (Aloe grandidentata) is common on rocky outcrops and grows in dense stands that are striking during its flowering time. Bushmanland, the northern part of the Nama Karoo, has elements of dry Savannah & subtropical species such as the Auas-mountains euphorbia or avasnoors (Euphorbia avasmontana), karee corkwood (Commiphora gracilifrondosa), Barleria lichtensteiniana and the Namaqua fig (Ficus cordata). Barleria lichtensteiniana or tongklapper (meaning tongue-cracker) as it is locally named has interesting fruits which explosively release their seeds when moistened. When a dry fruit is placed under the tongue it explodes; hence the Afrikaans vernacular name. The quiver tree or kokerboom (Aloe dichotoma) also occurs in this region. The display features a dried specimen with woodpecker holes in its branches. The giant quiver tree (Aloe pillansii) is much rarer than its close relative. The Karoo mother-in-laws-tongue (Sansevieria aethiopica) is widespread in the eastern and northern karoo. It usually grows in dense stands. Their edible rhizomes can be used as a source of water. The kambro (Fockea comaru) has a large underground tuber and is good for eating. It has a twining stem and small leaves that are difficult to detect among the other plants. Shrubs have also been established, including Pearson’s plumbago (Plumbago pearsonii), introduced from southern Namibia. It has silvery-grey leaves and pinkish flowers. 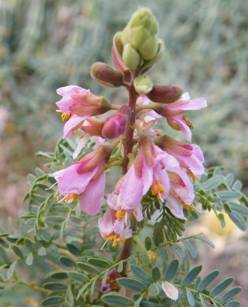 The very rare Gariep plume-flower or Gariep-pronkstert (Caesalpinia bracteata) only grows on Naros Granite formation on a farm in the Northern Cape, adjacent to the Orange River. It flowers during summer and has pink flowers. The butterfly leaf (Adenolobus gariepensis) grows commonly along the Orange River (Gariep River). It is an erect shrub to 4 m tall with reddish flowers during spring. The smelly boscia or stink-witgat (Boscia foetida) is an evergreen shrub with small grey-green leathery leaves. The yellowish flowers appear during spring and it has a foetid odour. The Damara corkwood (Commiphora crenato-serrata) is a small, winter deciduous tree which has recently been introduced to this bed. It is of religious significance to the people in the Kaokoveld. The feather-leaf corkwood (Commiphora kraeuseliana) is a small aromatic shrub from Damaraland and the Namib. It has compound leaves with thread-like leaflets.